Because the Higgs boson is a very massive particle and also decays almost immediately when created, only a very high-energy particle accelerator can observe and record it. Experiments to confirm and determine the nature of the Higgs boson using the Large Hadron Collider (LHC) at CERN began in early 2010 and were performed at Fermilab's Tevatron until its closure in late 2011. 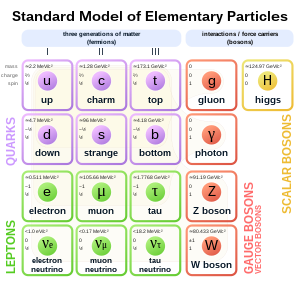 Mathematical consistency of the Standard Model requires that any mechanism capable of generating the masses of elementary particles becomes visible[clarification needed] at energies above 6993224304708179999♠1.4 TeV; therefore, the LHC (designed to collide two 6994112152354090000♠7 TeV proton beams) was built to answer the question of whether the Higgs boson actually exists. are the field strength tensors for the weak isospin and weak hypercharge fields. do not respect U(1) × SU(2)L gauge invariance. Neither is it possible to add explicit mass terms for the U(1) and SU(2) gauge fields. The Higgs mechanism is responsible for the generation of the gauge boson masses, and the fermion masses result from Yukawa-type interactions with the Higgs field. The SM also predicted the existence of the Higgs boson, found in 2012 at the Large Hadron Collider, as the last particle of the SM. Where does Dark Matter fit into the model? Does it even consist of one or more new particles? ^ Technically, there are nine such color–anticolor combinations. However, there is one color-symmetric combination that can be constructed out of a linear superposition of the nine combinations, reducing the count to eight. ^ R. Oerter (2006). The Theory of Almost Everything: The Standard Model, the Unsung Triumph of Modern Physics (Kindle ed.). Penguin Group. p. 2. ISBN 978-0-13-236678-6. ^ In fact, there are mathematical issues regarding quantum field theories still under debate (see e.g. Landau pole), but the predictions extracted from the Standard Model by current methods applicable to current experiments are all self-consistent. For a further discussion see e.g. Chapter 25 of R. Mann (2010). An Introduction to Particle Physics and the Standard Model. CRC Press. ISBN 978-1-4200-8298-2. ^ S.L. Glashow (1961). "Partial-symmetries of weak interactions". Nuclear Physics. 22 (4): 579–588. Bibcode:1961NucPh..22..579G. doi:10.1016/0029-5582(61)90469-2. ^ S. Weinberg (1967). "A Model of Leptons". Physical Review Letters. 19 (21): 1264–1266. Bibcode:1967PhRvL..19.1264W. doi:10.1103/PhysRevLett.19.1264. ^ A. Salam (1968). N. Svartholm (ed.). Elementary Particle Physics: Relativistic Groups and Analyticity. Eighth Nobel Symposium. Stockholm: Almquvist and Wiksell. p. 367. ^ a b F. Englert; R. Brout (1964). "Broken Symmetry and the Mass of Gauge Vector Mesons". Physical Review Letters. 13 (9): 321–323. Bibcode:1964PhRvL..13..321E. doi:10.1103/PhysRevLett.13.321. ^ a b P.W. Higgs (1964). "Broken Symmetries and the Masses of Gauge Bosons". Physical Review Letters. 13 (16): 508–509. Bibcode:1964PhRvL..13..508H. doi:10.1103/PhysRevLett.13.508. ^ a b G.S. Guralnik; C.R. Hagen; T.W.B. Kibble (1964). "Global Conservation Laws and Massless Particles". Physical Review Letters. 13 (20): 585–587. Bibcode:1964PhRvL..13..585G. doi:10.1103/PhysRevLett.13.585. ^ F.J. Hasert; et al. (1973). "Search for elastic muon-neutrino electron scattering". Physics Letters B. 46 (1): 121. Bibcode:1973PhLB...46..121H. doi:10.1016/0370-2693(73)90494-2. ^ F.J. Hasert; et al. (1973). "Observation of neutrino-like interactions without muon or electron in the Gargamelle neutrino experiment". Physics Letters B. 46 (1): 138. Bibcode:1973PhLB...46..138H. doi:10.1016/0370-2693(73)90499-1. ^ F.J. Hasert; et al. (1974). "Observation of neutrino-like interactions without muon or electron in the Gargamelle neutrino experiment". Nuclear Physics B. 73 (1): 1. Bibcode:1974NuPhB..73....1H. doi:10.1016/0550-3213(74)90038-8. ^ D. Haidt (4 October 2004). "The discovery of the weak neutral currents". CERN Courier. Retrieved 8 May 2008. ^ D.J. Gross; F. Wilczek (1973). "Ultraviolet behavior of non-abelian gauge theories". Physical Review Letters. 30 (26): 1343–1346. Bibcode:1973PhRvL..30.1343G. doi:10.1103/PhysRevLett.30.1343. ^ H.D. Politzer (1973). "Reliable perturbative results for strong interactions". Physical Review Letters. 30 (26): 1346–1349. Bibcode:1973PhRvL..30.1346P. doi:10.1103/PhysRevLett.30.1346. ^ Dean Rickles (2014). A Brief History of String Theory: From Dual Models to M-Theory. Springer, p. 11 n. 22. ^ Aubert, J.; et al. (1974). "Experimental Observation of a Heavy Particle J". Physical Review Letters. 33 (23): 1404–1406. Bibcode:1974PhRvL..33.1404A. doi:10.1103/PhysRevLett.33.1404. ^ Augustin, J.; et al. (1974). "Discovery of a Narrow Resonance in e+e− Annihilation". Physical Review Letters. 33 (23): 1406–1408. Bibcode:1974PhRvL..33.1406A. doi:10.1103/PhysRevLett.33.1406. ^ G.S. Guralnik (2009). "The History of the Guralnik, Hagen and Kibble development of the Theory of Spontaneous Symmetry Breaking and Gauge Particles". International Journal of Modern Physics A. 24 (14): 2601–2627. arXiv:0907.3466. Bibcode:2009IJMPA..24.2601G. doi:10.1142/S0217751X09045431. ^ B.W. Lee; C. Quigg; H.B. Thacker (1977). "Weak interactions at very high energies: The role of the Higgs-boson mass". Physical Review D. 16 (5): 1519–1531. Bibcode:1977PhRvD..16.1519L. doi:10.1103/PhysRevD.16.1519. ^ "Huge $10 billion collider resumes hunt for 'God particle'". CNN. 11 November 2009. Retrieved 4 May 2010. ^ M. Strassler (10 July 2012). "Higgs Discovery: Is it a Higgs?". Retrieved 6 August 2013. ^ "CERN experiments observe particle consistent with long-sought Higgs boson". CERN. 4 July 2012. Retrieved 12 November 2016. ^ "Observation of a New Particle with a Mass of 125 GeV". CERN. 4 July 2012. Retrieved 5 July 2012. ^ "ATLAS Experiment". ATLAS. 4 July 2012. Retrieved 13 June 2017. ^ "Confirmed: CERN discovers new particle likely to be the Higgs boson". YouTube. Russia Today. 4 July 2012. Retrieved 6 August 2013. ^ D. Overbye (4 July 2012). "A New Particle Could Be Physics' Holy Grail". The New York Times. Retrieved 4 July 2012. ^ "LHC experiments delve deeper into precision". CERN. 11 July 2017. Retrieved 23 July 2017. ^ Woithe, Julia; Wiener, Gerfried; Van der Veken, Frederik (2017). "Let's have a coffee with the Standard Model of particle physics!". Phys. Educ. 52 (3): 034001. Bibcode:2017PhyEd..52c4001W. doi:10.1088/1361-6552/aa5b25. ^ Altarelli, Guido (2014). "The Higgs and the Excessive Success of the Standard Model". arXiv:1407.2122 [hep-ph]. ^ "Particle chameleon caught in the act of changing". CERN. 31 May 2010. Retrieved 12 November 2016. ^ S. Weinberg (1979). "Baryon and Lepton Nonconserving Processes". Physical Review Letters. 43 (21): 1566–1570. Bibcode:1979PhRvL..43.1566W. doi:10.1103/PhysRevLett.43.1566. ^ P. Minkowski (1977). "μ → e γ at a Rate of One Out of 109 Muon Decays?". Physics Letters B. 67 (4): 421–428. Bibcode:1977PhLB...67..421M. doi:10.1016/0370-2693(77)90435-X. ^ R.N. Mohapatra; G. Senjanovic (1980). "Neutrino Mass and Spontaneous Parity Nonconservation". Physical Review Letters. 44 (14): 912–915. Bibcode:1980PhRvL..44..912M. doi:10.1103/PhysRevLett.44.912. ^ M. Gell-Mann, P. Ramond & R. Slansky (1979). F. van Nieuwenhuizen & D.Z. Freedman (eds.). Supergravity. North Holland. pp. 315–321. ISBN 978-0-444-85438-4. ^ A. Blumhofer; M. Hutter (1997). "Family Structure from Periodic Solutions of an Improved Gap Equation". Nuclear Physics. B484 (1): 80–96. arXiv:hep-ph/9605393. Bibcode:1997NuPhB.484...80B. doi:10.1016/S0550-3213(96)00644-X. ^ Salvio, Strumia (17 March 2014). "Agravity". JHEP. 6 (6): 080. arXiv:1403.4226. Bibcode:2014JHEP...06..080S. doi:10.1007/JHEP06(2014)080. ^ D.J.E. Callaway (1988). "Triviality Pursuit: Can Elementary Scalar Particles Exist?". Physics Reports. 167 (5): 241–320. Bibcode:1988PhR...167..241C. doi:10.1016/0370-1573(88)90008-7. W. Greiner; B. Müller (2000). Gauge Theory of Weak Interactions. Springer. ISBN 978-3-540-67672-0. L. O'Raifeartaigh (1988). Group structure of gauge theories. Cambridge University Press. ISBN 978-0-521-34785-3. E.S. Abers; B.W. Lee (1973). "Gauge theories". Physics Reports. 9 (1): 1–141. Bibcode:1973PhR.....9....1A. doi:10.1016/0370-1573(73)90027-6. Y. Hayato; et al. (1999). "Search for Proton Decay through p → νK+ in a Large Water Cherenkov Detector". Physical Review Letters. 83 (8): 1529–1533. arXiv:hep-ex/9904020. Bibcode:1999PhRvL..83.1529H. doi:10.1103/PhysRevLett.83.1529. S.F. Novaes (2000). "Standard Model: An Introduction". arXiv:hep-ph/0001283. D.P. Roy (1999). "Basic Constituents of Matter and their Interactions – A Progress Report". arXiv:hep-ph/9912523.